I've been thinking about switching to run the machine off 24V. I understand that the steppers run better, and the main reason would be to help with the amp draw from everything. I understand that the 12V supply that came with the stock R1 is pretty well maxed out. I haven't had many issues with the electronics of my machine, and I've been running it for almost a year. I don't run it 24/7, but there is rarely a week that goes by that it doesn't print something for me. The only real issue I had, was that the main power switch fried on me, other than that, been pretty good, but wanted to look into converting while I am doing some other overhauls on the machine. I welcome any and all insight on all aspects of converting to 24V. Does the bed need to be replaced, or can it run off of 24V ok? I have one of the newest style bed. What would you recommend for a power supply to purchase. Pretty much that is it. Any 12 volt fans will have to be changed to 24 volt versions unless you run a step-down converter for them (but probably not worth the trouble). The hot end heater must be converted to 24 volts. When I converted mine I didn't even have to re-tune the step sticks. They more or less don't care what the voltage is until they run out of it due to higher stepper speeds. The bed heater on the other hand is a problem. You can either run an external MOSFET booster and keep the 12 volt supply just for the bed heater, or purchase a replacement 24 volt version of the heated bed from FT or elsewhere (they are available), or go to an AC mains-voltage heater with an SSR to control it. You can't run the newer style bed heaters (short of a brand new R2 24 volt version) on 24 volts. It would draw something on the order of 38-42 amps at 24 volts all by itself and fry the wires that are going to it in the process. My $0.02 worth is to convert to the mains-powered heater and SSR and be done with it. It is virtually painless to do and once done you will wonder why you didn't do it before. My printer can go from dead cold to printing with the bed at 90C in around 4 minutes (I did that just last night in fact). I rarely go more than two days without printing at least one thing, so the stock warmup time added up fast. For a 24 volt PSU, the Meanwell units have a good reputation. I am using one of them myself (SP-240-24). But you have to size it appropriately for your end configuration. For example if you do convert to a mains-heated bed, you only need maybe 100-120 watts maximum (around 4-5 amps), which is mostly consumed by the hot end heater. For an extra couple of dollars, round that up to 150 watts to be safe. If you are going to use a DC-heated bed at 24 volts, then you will need a full 380-400 watts output (16+ amps) to supply it and the hot end heater and the motors. If you want to keep the 12 volt PSU wired through a MOSFET booster board only for the bed heater and then also have a secondary 24V supply for everything else, then only 100-120 watts again for the +24 secondary PSU. Thank you very much for your detailed and thorough response! I've done a cursory look online at some supplies and SSR's while on lunch at work, could you take a look at them and recommend any changes or brands I should be looking at, specifically for the SSR? Links to each are posted below. MEAN WELL RS-150-24 Enclosed Switchable AC-to-DC Power Supply, 150W, 24V, 6.5 Amp, 1.5"
What you have shown there looks good, but I think I may be able to save you a fair amount of money if you can tolerate a bit longer lead times (like 2-3 weeks). The power supply is just fine. Mine was quite a bit more expensive than that but it is a 240 watt version from a US supplier (I bought it a couple of years ago) and has an integral cooling fan. My sole caution about the one you show is that unless you do something to drastically improve the airflow through the electronics enclosure (as I did), you really need to get one with an integral fan. Fixed switching frequency at 90KHz. LED indicator for power on. AC input range selectable by switch. 90~132V AC/ 180~260V AC by switch; 254-370VDC. 100% full load burn-in test. Withstand 300VAC surge input for 5 second. | eBay! And even then I would seriously advise you to do something about the airflow in the enclosure. I put an 80mm fan and an 80mm outlet grille into the back cover on mine and everything runs very cool. I also recently posted a photo that shows how I mounted the heat sink for the SSR so that it gets lots of airflow (with the cover on of course). Mine is of course the 110VAC version (SRht300SQ-110VAC_3M) and runs a little over 500 watts with our local mains voltage (typically 122-125 volts). Be sure to get the version with the 3M adhesive. You can just attach it straight to the underside of your existing heater plate if you wish. I chose to fabricate a thicker aluminum plate for mine because I also added some safety over-temp switches to the sides and there wasn't enough room on the original heater plate. 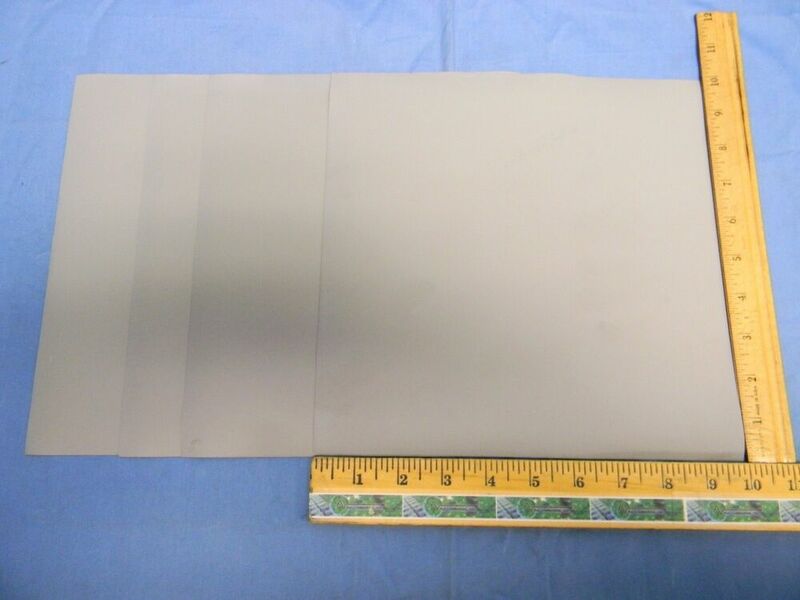 This sale is for 4 NEW Sheets Berquist Sil-Pad 400 0.007" / AC 10” x 10”. • Thermal impedance: 1.13°C-in2/W (@50 psi). Sil-Pad 400 is a composite of silicone rubber and fiberglass. The material is flame. | eBay! The Sil-Pad is optional, I just happened to have some of it in my work room. And then a mirror tile on top of that as the actual build surface. The setup as a whole works very well and is dead flat. The SSR you show is also OK, but you don't actually need 40 amps capacity, you only need maybe 10. But you do need a heat sink for it (or a surface to mount it on that will draw away heat, even if you do use the 40 amp version). And chances are that the one you have a link for is made down the road from the one above, if not in the same building by the same people. They were so inexpensive I bought a spare of each...! I did have to cut off the bottom plate of the heatsink (refer to website) and sand the bottom fin flat and then mount it using the fin as a mounting plate, but that is just because of how I chose to orient it. I had the auto power-down box to the right of it in the photo in the back of my mind the whole time and so I planned ahead for it. You might check RobotDigg for replacement 24 volt fans and the hot end heater cartridge as well. Be sure to get ball bearing or "mag-lev" fans, not sleeve bearing ones. They will last many times longer than sleeve bearing fans. and a 24v or 110v silicone heating pad. Good stuff. I am using the 24v version on my build. My 24v 500w PSU doesn't even blink when the pad is first heating up. Also very quick. The PSU is just one of the LED cheapo PSUs. I think I payed under $30 for it. A 24 volt silicone heater pad is certainly an option if placing an order with them, and falls nicely in line with the FT-5 R2 design. I realize that a 300 watt 24 volt heater pad "only" draws around 12.5 amps at 24 volts. So it is well within the "reasonable and safe" limits of the controller connectors, whereas a 12 volt version easily tops 23 amps. And we know that 23 amps is way beyond reasonable and safe for the board connectors on the RAMPS 1.4 board (as discussed ad nauseum in other threads....). I just felt that I wanted more bed heater power in my setup and 500 watts was just the ticket. Plus the OP could still opt to a smaller 24 volt PSU (like 120-150 watts) if so desired if also using a mains-powered bed heater. You do have to specifically request 500 watts from RobotDigg when ordering by the way. Ottherwise I think that they give you 300 watts even on 110 or 220 volt heater pads. The 750 watt versions that some other people have used are perhaps a bit of overkill, and require re-tuning of the heater control parameters to be stable. The 500 watt version I am using required no re-tuning at all. It just worked without issues from day one. I think either option is a good one. I have to say I have been very pleased with how fast the bead heats up with the 300w pad. I think it is < 5min for 100C. Keep in mind that I have the mirror tile sitting directly on the pad, and cork below the pad, so I am not heating a large aluminum plate. After running a PID, I never see it move once reaching temp. Keep in mind that I have the mirror tile sitting directly on the pad, and cork below the pad, so I am not heating a large aluminum plate. Mine has a fairly large thermal mass now. It will rapidly approach the setpoint and then start PWM'ing at around 2-3C below. It then creeps up to the setpoint and pretty much stays there for the remainder of the printing session. When I say "creeps", it is literally around only 4 minutes from power on to printing (I heat the hot end up at the same time of course). The other reason I wanted more bed power is because I have run the bed as high as 135C on occasion. The mains-powered heater I have will get to 135C in perhaps 5-1/2 minutes. There is no way the original 12 volt heater even could have reached that temperature and took 4x-5x as long just to get to 85C. I am not that patient a person to be honest. The Sil-Pad is, as I said, entirely optional and is a very recent addition (like less than two weeks ago). Before that I ran the mirror tile directly on the plate or over a very thin piece of steel sheet. I have noticed that the plate surface heats up more uniformly with the Sil-Pad and I have less troubles with things popping off it (ABS juice works wonders too).. I ran the thin sheet steel when I was playing around with an inductive prox switch for auto-leveling. I don't really need auto-leveling, I was just curious how it might work. I do things like that for fun. Since then I have abandoned that approach entirely in favor of a totally different scheme that I will post shortly, assuming it doesn't crash and burn . Oh, and I have run aluminum reflective tape that covers the entire support plate under the heated bed since day one. There is a small air gap between the tape surface and the bottom of the heated plate so that reflective barrier principles come into play. The support plate never gets too hot to hold your hand on. Thank you for the links @Ron, I will certainly wait a couple extra days for the savings in cost. One thing that I hadn't really thought about was controlling the mains powered Silicone heater. Currently, the FT-5 when it finishes its print, parks the nozzle and shuts off the hot end and heated bed. 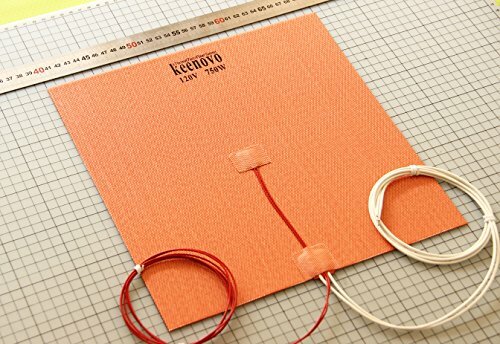 With all that said, I am now leaning toward a 24V silicone heater instead, mainly because I will be able to maintain the current level of safety I have now after a print finishes. The current question I have with running this setup then becomes, Will I still need a MOSFET to control the DC power to the bed from the MKS board? Thanks guys! I really, really appreciate all the thoughtful responses as well as great conversation! Might have just answered my own question, but would this work to control the DC-DC control of the 24V silicone heater bed? Yes, that will work quite nicely. You will of course still need to purchase the heat sink that goes with it or one like it. And you will also need to purchase a larger DC supply such as the one @mstrauss did (500 watts) to be able to supply it. But it should work just fine. Not to sound like a broken record, but if you put an even larger PSU in the enclosure, the need for improved airflow will become incrementally more important. If you have questions about the auto shut down, please just post them in that thread and I will be more than happy to answer them. I am loving having that added feature, but like you I do tend to check on prints in progress every so often anyway and probably always will. Will I still need a MOSFET to control the DC power to the bed from the MKS board? No you do not... I run with the MKS SBASE controller, but the onboard MOSFETS are basicly the same. The <14Amps from the 300w heater @ 24v is not an issue for the controller. I will add that I don't think the 24v vs 110v silicone pads are safer when it comes to a fire hazard. Both can start a fire if not managed correctly. I went with the 24v version as it made the most sense to me. It has enough power, works well with the controller board MOSFET, and does not require additional hardware (SSR or relay). I also have a main power safety realy, secondary 5v PSU and arduino for monitoring the printer, and shutting it down if an issue is detected. I am not all the way there with it yet, but having a single main PSU for everything "printer" makes it simple to manage. That is not to say I couldn't supply power to a 110v heated bed via the same main power control relay. The only safety aspect of using a 24v heater vs 110v, is not having the mains voltage outside the electronics box. This eliminated the potential shock hazard if something should go wrong with the wiring or pad, and you come in contact with it. However, if done right, the 110v pad can be done safely. The added safety hazard posed by a mains-powered bed heater versus a DC powered one is primarily of the plate becoming somehow shorted to the feed wires. I run a heavy grounding wire to my build plate just for that reason and contain the wires to the bed in braided covering. I also have plans to eventually fit a GFCI to my printer, and at the moment I am using a GFCI-protected outlet for it. In terms of thermal run away though (a much larger concern that you are addressing with your Arduino), watts are watts. Given the same number of them being applied it does not matter whether they are AC or DC watts. The build plate could get dangerously hot quite quickly. For that reason I added thermal switches and a mains cutoff safety relay to mine. As for an external SSR or MOSFET it only makes sense (to me anyway) to off-board as many loads as possible from the MKS board. It has marginal thermal dissipation capability for the on-board MOSFETs to begin with. An external device most likely will have better connectors for the higher current wiring and a proper heat sink. That way both it and the MKS devices will run cooler and will be less likely to fail in the first place. Plus a $5 SSR is a lot cheaper than a $40 MKS board to replace if for example the wiring to the bed heater gets pinched or frayed. I could make the same argument for the hot end heater, and I know that people have fried their MKS or shield boards when there were wiring shorts. My now unused MOSFET booster will eventually be re-purposed for the hot end heater just for that reason. I may have not explained my explanation of the 24V DC bed being "safer" than the 110V AC bed very well. I understand that they both have potential to cause problems if something were to go awry. However, minus the Thermal Runaway protection on the MKS board, I do not have anything currently that would mitigate this. The MKS board controls the AC bed through the SSR. So when the print finishes, the MKS board will send signal to the SSR to cut power, won't it? Yes, because the MKS board's normal output for the bed heater is instead connected to the control input for the SSR. So if you set the "end of print" Gcodes to turn off the bed heater the output from the MKS will turn off and then the SSR will turn off. In fact you must have it connected this way to be able to control the temperature from the MKS. It comes for free with connecting the SSR's inputs to the MKS's bed control outputs. You may be confusing an SSR (which is merely a fast line voltage relay of sorts) with an external temperature controller. The MKS board is still the controlling device for temperature. The SSR is just a power and voltage booster for it in effect. On the other hand, if using an external temperature controller you would have to devise some method of shutting it off. That sets a bed heater target temperature of zero, which effectively shuts it off. Ron, I took your suggestion and now power the hot end through a DC-DC SSR fed from a 2amp DC din rail breaker. Works fine. The next step is to remove the pair of wires from the second connector down (+24,com.) on the power supply to the MKS board. Dustin Corbin told me that this pair is wired through the mosfet that supplies the power for the heated bed. I use a line powered bed so not needed. How many amps do you think the board alone will draw? I want to put a breaker in the line that supplies+24 to it. 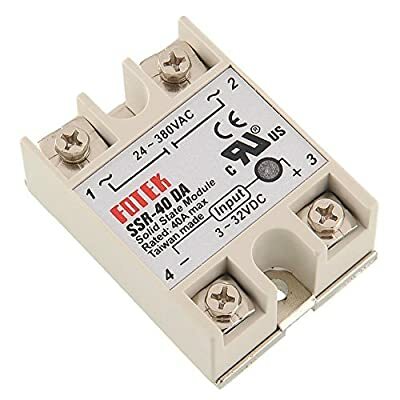 If you remove the second set of +24/GND connection inputs from the board when you are using an SSR for the hot end heater and another for a mains powered bed heater, you will be just fine. I don't know exactly how much power is consumed by the board and the steppers (don't forget them) because it varies during operation, but I would estimate it to be on the order of 2-3 amps. This is because the step motor drives act as power converters (watts in, watts out). At higher stepping rates they may tend to consume more average amperes because they are producing more mechanical power output (rpm x torque). So I would size a breaker for it at perhaps 4 amps to have some safety margin. 2 amps for the hot end heater breaker is OK as you noted, but it is a bit close for a typical 40 watt heater (1.67 amps at 24 volts). I would have sized it at 2.5 or 3 amps, but that's just me. I prefer to size breakers at 125%-150% of their intended loads. But it depends upon the trip curve of the breaker too. Lots of variables, however you are most certainly in the ball park. As mentioned, the future use of my now spare MOSFET booster for the hot end heater is definitely on my list of things to do, as you did. I am just preoccupied with getting a Bowden Titan setup installed at the moment. But I will get around to it. I want to relieve every bit of electrical and thermal stress from the controller board that I can. Not sure I understand the need. Forgive me for being blunt, but it sounds like getting a car with overdrive and never going higher than 4th gear (am I dating myself). At 24v the MOSFETs on the controller are just fine for both the hotend and bed heater. This is what these boards were designed to do, why wouldn't you use it. Granted, I am using the SBASE controller, but the MOSFETs don't even get warm with forced air over the heatsink. Blunt is perfectly fine with me. I would not exactly agree with the analogy (I drive manual transmission vehicles every day BTW and have for most of my life ). My point was all about safety margins and that if something fails will it be on the board or on some external (cheaper to replace) device? And as you said, you are not even using the same board. The larger power connectors on the stock FT-5 controller board are rated only to about 16-18 amps (on a good day with a full moon and favorable breezes). The smaller ones are only good for around 8-12 amps. And that is if you can verify who made them and to what specification. So many factors that can go wrong. You are however quite correct that at 24 volts they should be "OK". You will get no disagreement from me on that. At 12 volts however, as the vast majority of these kits were shipped, they are definitely not. Unless something is done to increase the airflow across the board and its connectors though they may still be marginal even at 24 volts. You have done that. So have I of course. But when giving advice in an open forum, improved airflow is not a "given". Do you really trust a lowest bidder manufacturer somewhere in China that is not even open source with no published specs or parts lists (check the various wikis on them) to provide MOSFETS that have low RDSon consistently? The high power connectors on MOSFET and SSR external modules are easily capable of handling several times more current than the on-board ones with far less fuss. They can accept fork or ring terminals for example. And they can be tightened and/or torqued with reasonably sized screwdrivers (as opposed to the jeweler's screwdrivers required for the on-board ones). Of course for mains-powered bed heater versions that much is a moot point. As for the hot end heater, true it only draws a couple of amps at 24 volts. Actually I have a 60 watt heater in mine so it draws around 2.5 amps. But I still trust the connectors and heat dissipation on an external MOSFET/SSR module much more than I do either of those things on the controller board. It's just my opinion based upon similar things I have seen get hot and melt (or worse). But if everything is done correctly and checked every so often, you are quite right that the board itself is "OK" for the hot end heater at 24 volts. We have smoke detectors in pretty much every room of our home (beyond legal requirements). Why? Better to be safe than sorry. Well, I won't argue with you on this, I think your approach certainly will not hurt, and could help in some instances. Just remember we are talking about a $30 controller. Don't some people pay that much for high-end filament?